This CACU Book summarizes the reviews published during the previous International Fluid Academy Days. The papers are published under the Open Access CC BY Licence 4.0. Critical and Acute Care Ultrasound together with point of care ultrasound (POCUS) is becoming a holistic and translational discipline and is considered as the modern stethoscope for the critical care and emergency care physician. This book is edited by Manu Malbrain, Internist-Intensivist, Director of the Intensive Care Department at the University Hospital in Brussels (UZB), Belgium, he is Professor at the Vrije Universiteit Brussel (VUB) and one of the chairmen of the iFAD meeting. The book is written by 31 key opinion leaders in the field of POCUS (point of care ultrasound) like Daniel Lichtenstein from Paris, Adrian Wong from Oxford, Michael Slama from Amiens, Antoine Viellard Baron from Paris, Paul Elbers from Amsterdam, Jan Poelaert and Manu Malbrain from Brussels and many more. 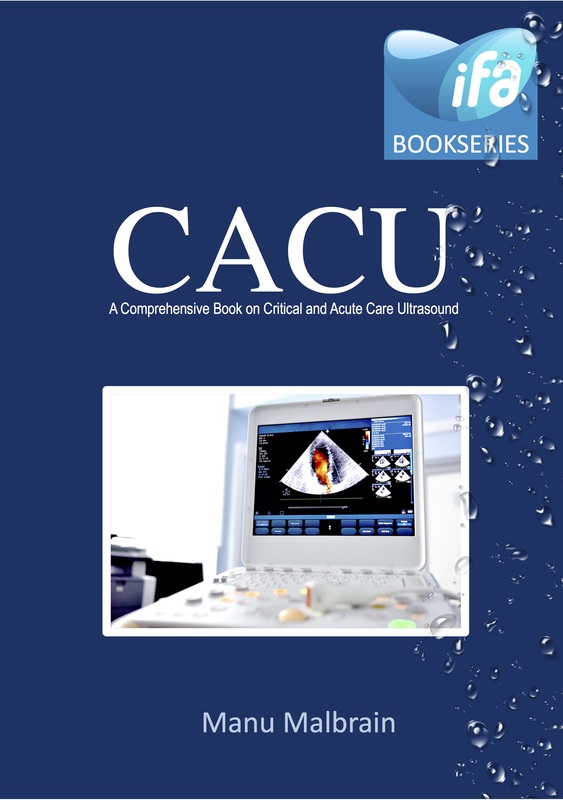 The CACU book contains 11 chapters, 154 pages, 73 figures, 13 Tables and 12 protocols (BLUE, SESAME, FALLS, GUTS,...). Chapter 6. Cardiac Ultrasound: A True Haemodynamic Monitor? Below are some screenshots from figures. There are practical pictures on how to hold your ultrasound probe, different views, calculations. It covers wholistic ultrasound covering vascular access, lung ultrasound, cardiac ultrasound, abdominal ultrasound. You can download the CACU book for free if you are an IFAD member (membership is FREE for lifetime).